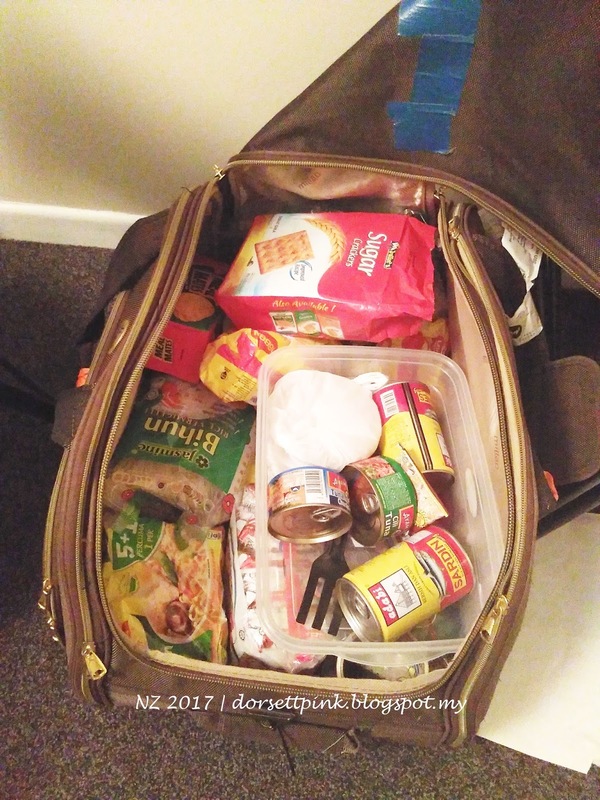 The Foods That We Brought From Malaysia to New Zealand. Everybody knew that NZ and Australia has applied a strict rules of legislative on items coming into those countries especially foods, any parts of plants & any parts of animals. These prohibited and restricted items has been introduced to protect the community especially the environment and the economy of New Zealand. 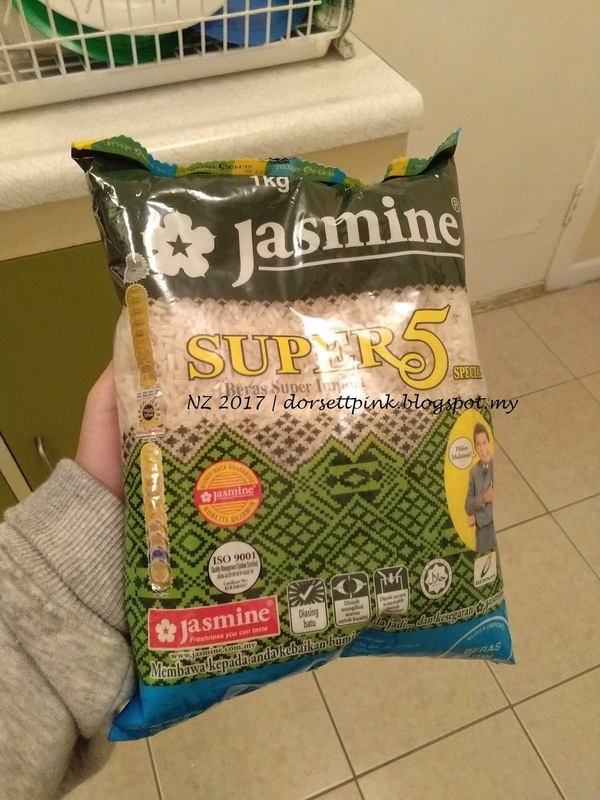 So, before u depart to NZ, please make sure you do a detail research on what foods that can be brought into NZ..
John , the owner of kakiberangan.blogspot.my has shared those informations. You can read it HERE. Hence, i just brought few items into NZ, but i've to declare it on NZ's Passengger Arrival Card upon my arrival. Thus, it means that we've to buy a lot of foods in NZ. Alhamdulillah, everything went smoothly upon the customs checking. The Customs Officer put a serious question on my baby's formula milk 'coz MILK or any foods that contains milk including nescafe & milo is prohibited to enter NZ. I have to declare it on Arrival Card. Customs : What food you bring ? Customs : Only noodles ?? My Husband & I : Yupe ..
Customs : Any fruits or plants ? My Husband & I : Nope. Customs : Are you sure ? My Husband & I : Yes..
Customs : What kind of milk? Customs : Only infant milk ? Customs : Powder ? How many ? My Husband & I : Yupe, it is a powder milk, only 1 tin. Customs : OK, check your bag at X-ray machine . Enjoy your holiday ! Everyone has to pass the x-ray machine to reconfirm the items that you brought into NZ..
And here also has a dog waiting for any cheating individuals.. hehehe... So , be careful guys..
Sardin, Beras, Bihun, Tuna jenama Ayam Brand, Maggi, Macoroni, Spageti, Potatoes jenama Pringles. Biskut tu beli kat sini (NZ). Tapi ini pun tak cukup, kena beli lain kat NZ ni. Bawak BERAS dari Malaysia 4 paket 1 kg beras . Make sure plastik beras ni TAK TERKOYAK tau & jangan ada kutu beras dalam tu. 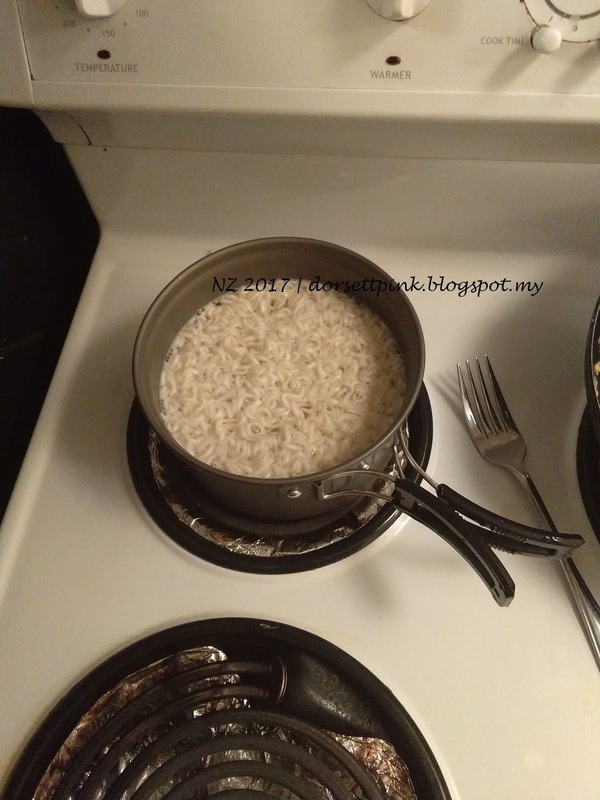 4 pek tu tak cukup, so kitaorang beli lagi beras kat NZ ni..
Hari first masak maggi. Periuk tu aku bawak dari Malaysia. This is one of my portable cooking set, perfect for travel coz the size is so cute. Beli kat LAZADA masa Sale last year. Muat nak letak dalam luggage baju aku. 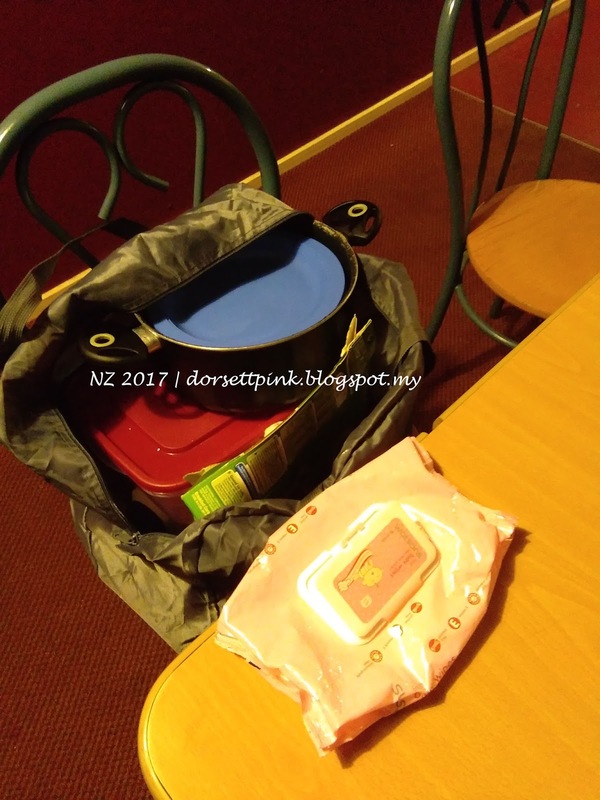 Pastu, makanan yang dah siap masak & ready untuk dibawak sebagai BEKAL / BENTO dalam perjalanan nanti, kitaorang letak dalam bag foldable ni. Beli kat LAZADA. Aku wajib bawak tissue sekali. 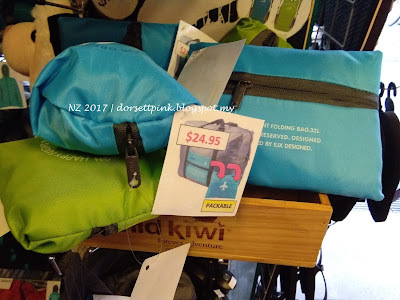 Beg travel yang foldable ni aku beli kat Lazada masa Lazada buat SALE last year, aku beli dengan harga RM 20 jer, tapi yang dijual di New Zealand ni harga dia NZD 24.95 (RM 72). TIPS : If you wanna bring some foods from Malaysia, excluding the prohibited items, PLEASE MAKE SURE that it is in the seal plastics or containers that u bought straight from the shop. 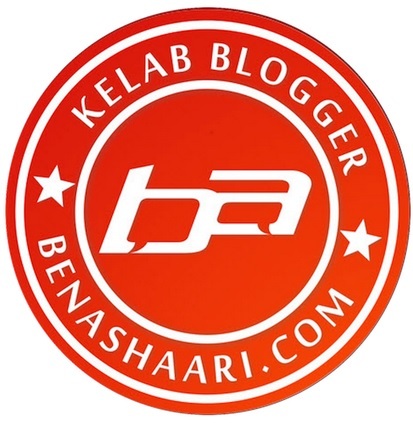 Jangan ada bahagian yang terkoyak ! Last but not least, Thank you for reading this entry.. Thanks for the info dear..
Banyaknyaaaaaaaa makanan akak bawa. 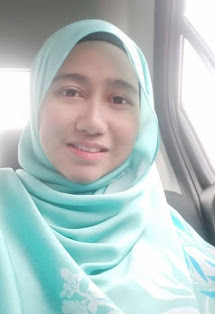 Lazada belaka. Nak kena terjah jugak Lazada ni kang. Banyak barang murah kat sana.